Analysis The great techno-utopian fantasy for years has been that eSIMs will destroy mobile networks' lock on customers – allowing real-time switching. The phone would tune into the best signal. This notion was touted by the same sort of people who 15 years ago thought Wi-Fi would kill off mobile networks – Clay Shirky, WiReD magazine and some helium-headed venture capitalists in California. That lot. Attractive as it sounds to the punter, it's going to remain a fantasy – Apple has made sure of it. "For Apple it's a means to an end, rather than end in itself," Dean Bubley of Disruptive Wireless told us. Bubley sparked off a widespread debate recently with a comprehensive look at the drawbacks of an eSIM-based world. The "end" is dual-SIM phones – and Apple is using an eSIM to save space for a second number, rather than as part of a cunning plan to usurp the world's mobile networks. "Given Apple's evident attempts to broaden its range and reach, it was likely to address this sooner or later. Given it probably wouldn't want to cut two SIM slots in its chassis, or incur the extra volume the trays would use, it makes sense to have one as an embedded chip, which then implies eSIM in order to provision it," Bubley said. And that's evident in Apple's presentation. Three new iPhone models announced Wednesday all support a secondary eSIM chip, alongside a physical SIM slot. This allows you to snap a QR code from a carrier, and the provisioning for the secondary account takes place behind the scenes. 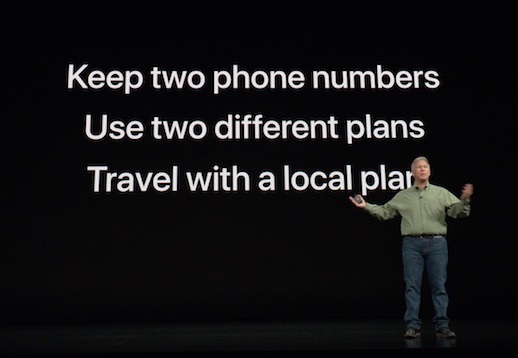 That's great for roamers, Phil Schiller pointed out, who want to keep their number while travelling, while scooping up the low-cost data plans native to that location. Obviously, that's a long way from real-time network switching. There are technical and commercial questions to be resolved - like what happens to your "unused credit" when you zap a new plan on top of your eSIM slot? Do you lose the old contract? Do you get a refund? But generally it's fairly straightforward. Far more vexing problems would arise for anyone attempting to offer a real-time switching service, a pirate MVNO. The other benefits Apple's Phil Schiller touted this week are fairly tentative. 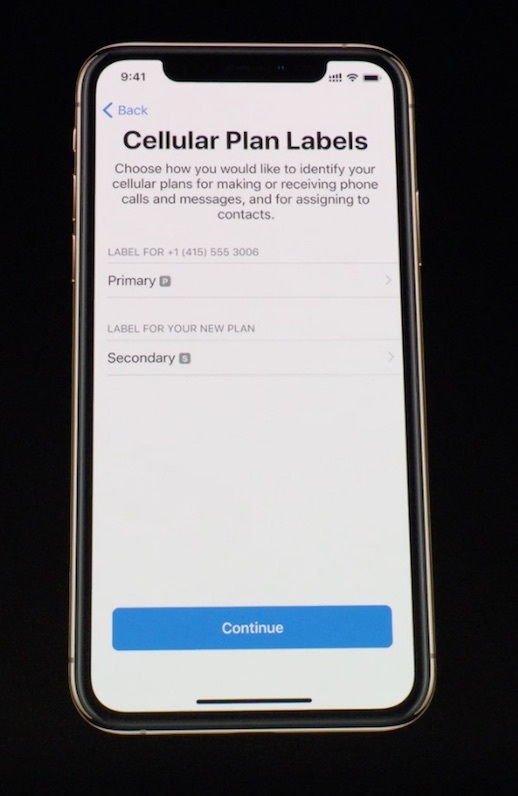 "Some people want two phone numbers," Schiller said, which is true. But in many markets, particularly North America and Europe, people already do – and the punter has shown no great willingness to insist they go in the same device. Apple helped design the eSIM specification, which does away with the need for a piece of plastic, so of course it was only a matter of time before Apple used it in phones. It's been quite a long time, though - Apple was first granted an eSIM patent in 2011. So long in fact, that eSIMs were considered a very dead idea. Even after Apple quietly introduced eSIMs into the iPad in 2016, and the Watch Series 3 last year. The real-time switching fantasy was revived when word got out that Apple was involved in eSIMs. But Hell would freeze over before our mobile networks would dispense with the plastic SIM, and agree to real-time switching. That's because it destroys the business case for spending even a penny on new network capacity. A SIM card is simply an access card, which temporarily locks you into a network contract. The "lock" may be very porous, as with a prepay SIM, but it still provides sufficient incentives to keep you there for a while. People have your number, for example. How would people find you in a real-time switching world? Moreover, it isn't easy to imagine how a new, disruptive real-time switching MVNO would actually operate, if networks kept the gates shut. Perhaps it could buy millions of SIM cards from the incumbents, and leave them under the incumbents' cell towers. I wonder how long that would last. And punters want a decent service that works everywhere, so the value is really in a decent network, not some intermediary which promises you a few extra kb of speed, but which adds a great deal of uncertainty. For smaller networks, though, there's going to be a frantic scramble to make their kit compatible with the new hybrid world. "It will be interesting to see which operators (and in which countries) actually offer downloadable SIM profiles – and whether the phones will support easy switching/swapping between them," mused Bubley. As he noted recently, Apple can swallow the margin of a second bit of electronics that few people use. But budget Android phone makers are less inclined to do that.